The Bach 190 series Bb trumpets are the most versatile available offering more options that meet the demanding needs of today's most discriminating players. Vincent Bach combined his unique talents as both a musician and an engineer to create brass instruments of unequalled tonal quality. Often copied but never duplicated, Bach Stradivarius instruments today remain the sound choice of artists worldwide. 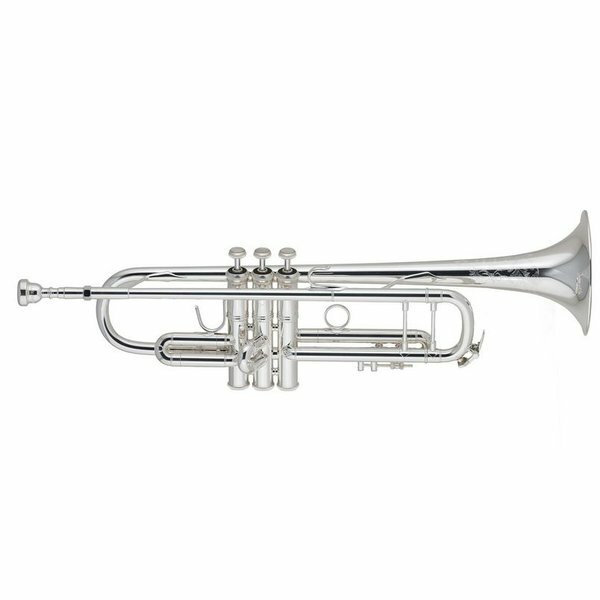 The Bach 190 series Bb trumpets are the most versatile available offering more options that meet the demanding needs of today's most discriminating players. The Bach 190 series trumpets are the number one selling professional trumpets in the world. The 190S37 features a #37 one-piece hand-hammered professional bell that produces a warm sound with great projection allowing this instrument to work well in multiple musical settings-from jazz to concert or solo playing. The #25 leadpipe allows for slight resistance that is effective in centering tone production. The clear lacquer finish provides a subtle warmth to the overall sound. These features combined with a .459" medium-large bore allow the player to produce a well-rounded sound well suited for all types of music. Bach "Stradivarius" - .459" Medium-large bore, standard weight body, standard weight yellow brass one-piece hand-hammered #37 bell, standard construction #25 mouthpipe, monel pistons, 1st slide thumb saddle, adjustable 3rd slide rod stop, clear lacquer finish, Bach 7C mouthpiece, C180 woodshell case.